The Stamping Boutique DT Post - Christmas in June? Well I decided long ago that I needed to start making Christmas cards earlier in the year so that I'm less stressed come Christmas time! Today's post is the first Christmas card I've made in a while so I better get busy! Anyone who knows me knows that I LOVE SNOWMEN! When I first saw this image "Snowman Scrapbook Journal" at The Stamping Boutique I knew I had to have him! 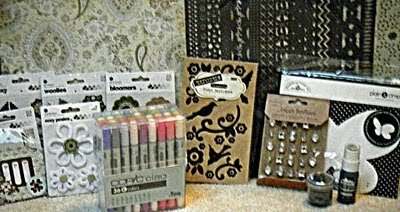 Basic Grey Capella line: 12 designer papers, 5 matching cardstock, 2 doilies, chenille flower, felt sticker, epoxy sticker, diecut shapes, and fabric flowers. Doodlebug chipboard butterfly, Scrapworks vinyl appliques, Jolee's boutique dimensional stickers, acrylic paint dabber, embossing powder. Check it out for more details! You don't want to miss out on your chance to win this one! 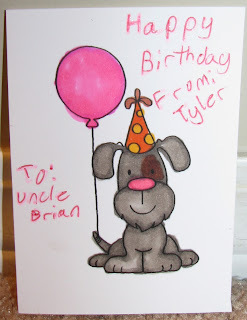 Paper Sundaes Challenge #24 - Birthday's with Stamp & Create! I love how he decided Buddy needed a brown eye patch, SUPER CUTE! Be sure to check out the other DT creations at Paper Sundaes they are AMAZING! 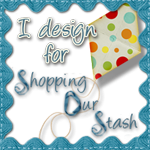 The Stamping Boutique Blog Hop - You're Sew Sweet! I coloured the image with copics and spica glitter pens and used cardstock and paper from my scraps. Being as the theme is sewing I decided to incorporate some on my card. Since I didn't have any pink thread I decided to use my DMC floss and handstitched the border around the outside of the card (shhh.....I NEVER said sewing was my strong point but it was fun)! I added some buttons and pink ribbon from my stash as well! I couldn't decide on a sentiment so I left it blank for now but I think I will add "Thanks.....you are sew sweet" when I send it out later! Isn't this image just adorable? PS - Don't forget to join us this Saturday, June 26th from 7-9 pm CST over at SNR for our digi day celebration. The theme is Summer Fun. Hope to see you there! For my card I decided to use the "Princess Gwendolyn" digi image which you can pick up here. She is also available in rubber if you prefer. As soon as I saw this image I new I had to have her as she is simply adorable and perfect for a card for a little girl. I coloured this with copics & cut out with my nesties. Unfortunately I had multiple projects on the go and my workspace was a HUGE mess so all my copic colours got mixed up and I didn't keep track of them. The design paper I used was from Best Creation Inc and it is so sparkly but I couldn't get that to show well in my photo. I used primas with some mini pearls and a "Sweet" sticker sentiment which I stuck on to paper then cut out and used pop-up dots to raise it up. 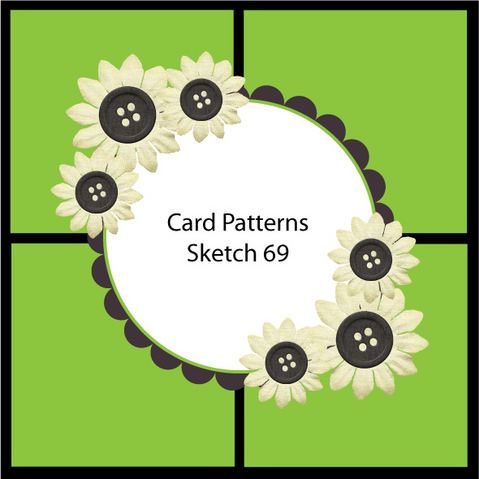 Check out Card Patterns to play along with this sketch and REMEMBER: If you use one of The Stamping Boutiques images please enter it on the TSB Challenge Blog for the June Challenge for your chance to win 5 free images! Can't wait to see what you come up with! 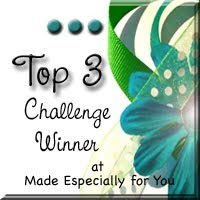 The Stamping Boutique is sponsoring a challenge over at Fussy & Fancy Friday Challenge Blog and the theme is "monochromatic with a twist"! The twist is that your image must include something with wings! This is the first time I've ever created a monochromatic card so I'm not sure I've done it completely right so don't be too hard on me! 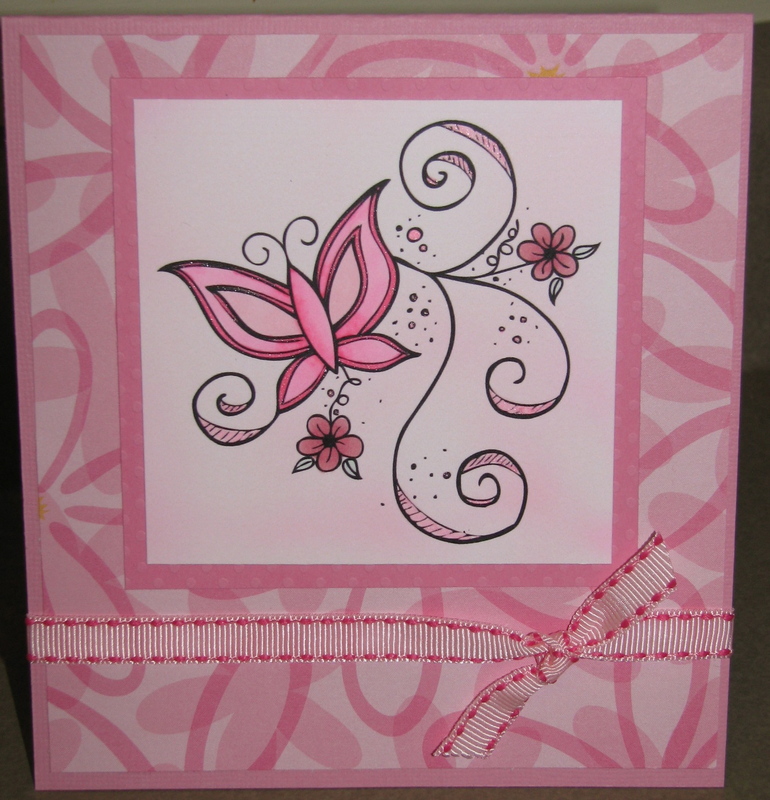 Here's my card which I created using The Stamping Boutique image "Butterfly". I love this image it's so whimsical! I coloured it with various pink copics and then used my pink spica glitter pen to highlight certain parts. If anyone can give me tips on taking photos so that glitter/sparkle shows up better I would LOVE to hear them as I always have a problem capturing the shimmer! Have a wonderful weekend everyone, happy crafting! 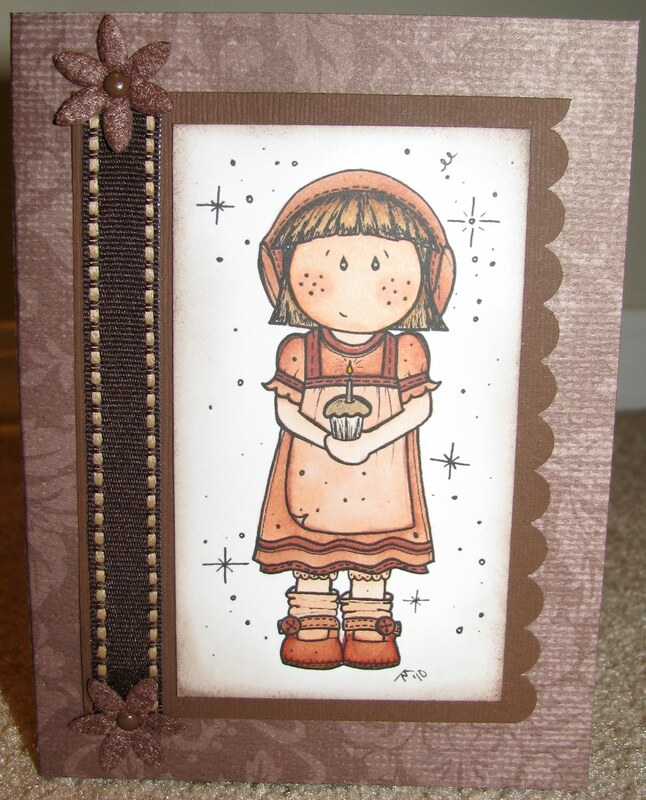 I chose to use the image of CC Designs Sugarplum Tulip Trevor for my image & the sentiment is two different stamps from the Amy R set "Big Words & Handy Additions" both which are available at All That Scraps! I coloured the image with copics (E00, E11, E41, E43, E33, E35, E39, R22, R24, R29, E44, B41, B23, and B21) and then airbrushed the background of my oval with my airbrush system. The flowers I got from a secret sister swap from Danielle and the ribbon & pearl brad are from my stash. I managed to use up some scrap paper I had in my scrap pile but I'm pretty sure this is from Bo Bunny! Serenity - With a little help from a Special Someone! I was colouring some of my images from The Stamping Boutique tonight and my son Tyler asked if he could help me make a card. Of course I said YES! He loves to colour with me but when it comes to cardmaking he'd much rather skip it and go watch cartoons, read a book or play a game! So here is what he helped with! Don't forget to head over to The Stamping Boutique Challenge Blog & show us your TSB creations for your chance to win some free images in our new monthly contest! 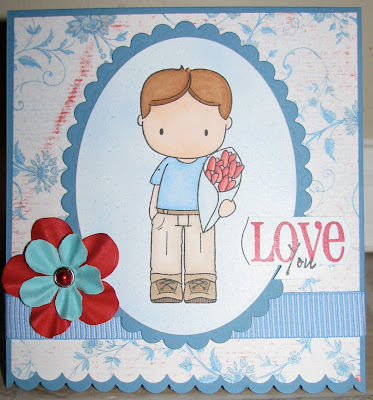 I'm excited to post another card I made for The Stamping Boutique! 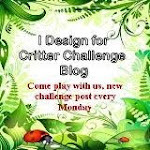 Today TSB is sponsoring a challenge over at 2 Sketches 4 you and this is my creation. For my card I'm using a new digi image "Cynthia Gathering Mushrooms" which you can pick up over at the TSB store. I coloured the image with copics and added a fair bit of sparkle with my spica glitter pens however it isn't showing up too well in the photo. Other supplies used: oval & oval scallop nesties, felt flowers by Hero Arts, Bazill cardstock, and Swiss Dots Cuttlebug embossing folder. I love this fabulous DP which is from my scraps so I'm not sure of the manufacturer. It's so pretty with all the glittery flowers! Ooooh I almost forgot! If you join us at The Stamping Boutique Group here over at Paper Craft Planet you can get this image for free! All the details are on the group page so be sure to check it out! 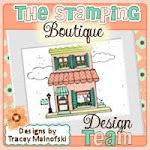 REMEMBER: The Stamping Boutique is now offering a monthly challenge so be sure to check out the website and show us your creations using TSB images for your chance to win free digi images of your choice! The link is here! It's time for another Paper Sundaes Challenge - #21 and we would like you to create a card with the theme of SUMMER FUN! What could be more fun than a PARTY to celebrate summer? This week Paper Sundaes is being sponsored by Sassy Cheryl's! As soon as I saw this image "Sassy Cinco de Mayo Cheryl" I knew I had to have her! This image is SO MUCH FUN! I love that it's a digi image so I can size it to whatever fits my needs but I think she would be great for scrapbook pages, party invitations, you name it! I coloured her with copics (E00, E11, E13, E15, E17, E53, E55, Y15, Y17, YR14, R22, R24, R29, G14 and G16). I used my Lemon spica glitter pen to colour part of the star necklace & trim on her dress and added glossy accents to her maracas. Other supplies used: Cuttlebug swiss dots folder, SU corner punches, & Crimped Alpha Stickers from Momenta. 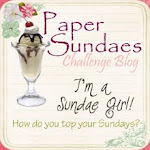 Hope you play along with us this week at Paper Sundaes as we would love to see your "Summer Fun" creations! My Splitcoaststampers Swap has finally come to an end so I can post the card that I made for the swap. 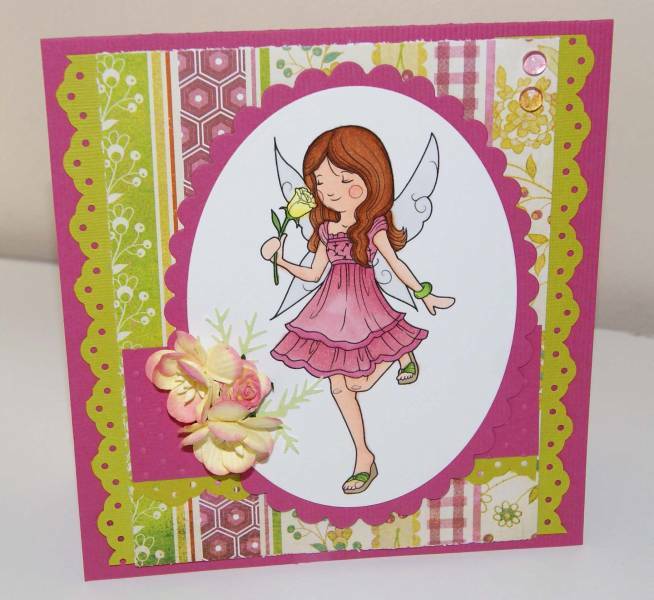 I chose to use Paper Makeup's "The Rose Fairy" for my card. Isn't she so pretty? I'm super excited to be posting my first ever card as a member of The Stamping Boutique Design Team! The digi images are super adorable and as soon as I saw this one "AJ with Sign" I knew I had to have it as it reminds me of my son! I made this card for my son to give to his Dad on Father's Day. 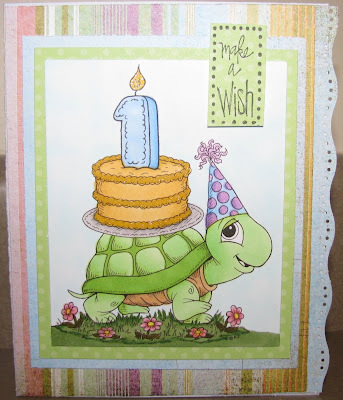 Here's a quick card I made tonight for my nephew Logan's first birthday on Thursday. Being as he's only turning one I kept it simple. 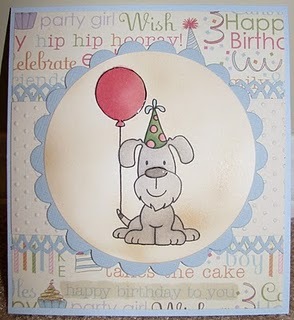 The image I used is from Karen's Doodles and is called Herbert Birthday Cake. I paired him with the #1 from the Herbert Birthday Candle Set. This set is amazing as you can change the numbers so you can use it again & again. This is a great digi image set for sure! I coloured with copics and the sentiment is one that I picked up from Michaels along time ago. Other supplies used: EK border punch, Lemon Spica Glitter Pen.